Well, this is winter where we live. We all knew this type of snow storm was coming. The kids woke up this morning, looked out the window, and were completley mesmerized by all the snow they saw. I think the pile on our patio table shows it the best. 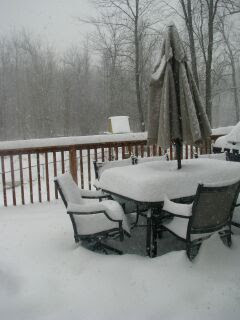 The snow was still coming down when I took this photo too so it was even worse by the time it stopped. Knowing we couldn't travel very far we decided to head over to our neighbors house across the street to have a play date. 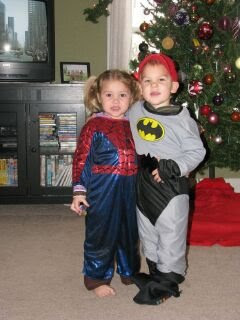 The kids had so much fun, especially when the decided to play dress up. Well I managed to drive over to the neighbors house safely and even drive home safely... however once I got into my own driveway I got stuck! And of course within feet of pulling into the garage. 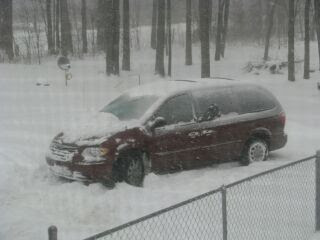 I kept backing up and trying to go forward and it just wasn't working with all the ice on the driveway under the snow. So finally I said forget it! I parked the car and headed inside with the kids. Within a few hours Doug came home and plowed the driveway with his excavator and then pulled the car into the garage with the excavator too. Gotta love winter right??? Not me! 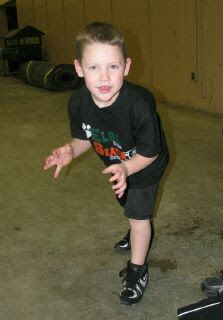 Well I finally made it out to one of Isaac's wrestling practices. It was great to watch him... finally realizing how much he really does love it. 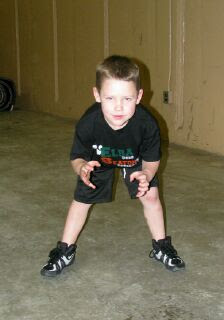 I'm gradually learning the wrestling terms; such as crossface, double leg, single leg, drive, etc. Doug keeps reminding me that one day I will be one of the moms sitting in the stands who just can't contain herself screaming at the top of my lungs. I guess if Isaac can learn to love wrestling, then so can I. I'm just really excited that him and Doug have a passion for the same thing. It's fun to watch them at night in the living room practicing moves too! 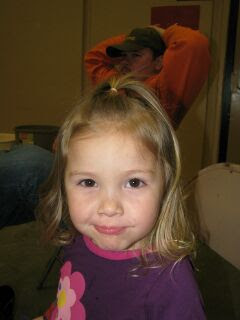 Little Bella had fun watching Isaac as well. She made a friend that night too (another little girl her age). 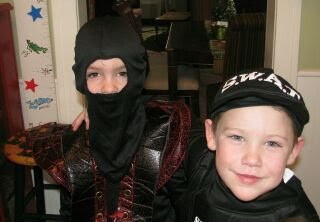 Maybe future mat rats? 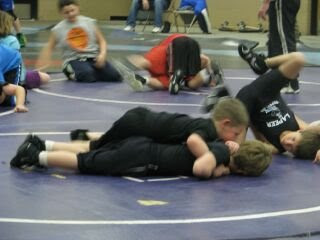 Here is Isaac getting some advice from his coach while he tries to take down his wrestling buddy Joey. As for this picture below... don't ask. I don't know... other then maybe that wrestlers need to be flexible. Good job little guy doing a twist! 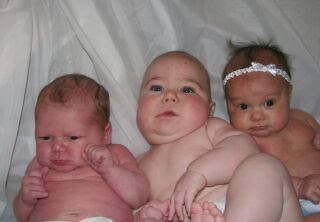 Here is the most recent round of Norton Babies. I love these photos! For some reason, Carter always looked mad. I love the difference in skin tones too! 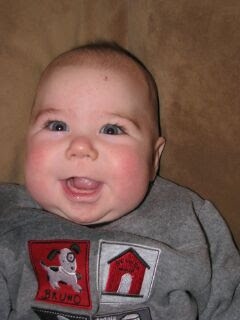 You can tell my little guy has sensitive skin with it being so red. This above picture is great! Shows a little personality in each baby... especially little Emily! 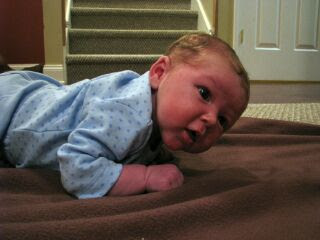 And I couldn't help but to include this picture below of Joshua. He is such a chunky baby and I LOVE his cheeks. Every time I look at him and hold him my heart melts! He's so cute! For any of my readers that really know me, also know that the Norton girls tend to have our children in rounds. When I married into the family 3 of the sister in laws were already expecting... within a month of our marriage I found out I was expecting Isaac as well. What is so great about "the pregnancy rounds" is that our kids always have a friend... their cousins. 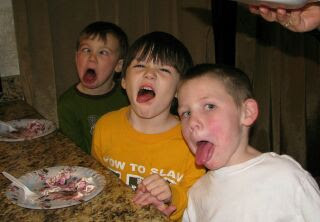 Brandon, Nathan, and Isaac (all age 5) are all best buddies and LOVE playing together. They all get so excited when they see eachother. These pictures are perfect. 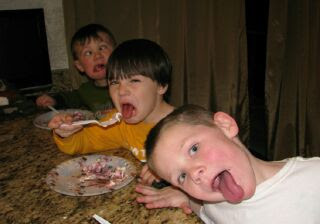 They are crazy boys who are usually wild and hyper and goofy when they get together. There was one more cousin, Emma, in this "round" but she lives out west. We miss you Emma! As do the boys!!! My sister made this slide and I thought it was so cute! So she sent it over to my blog. After we had the gingerbread day at Grandma's my mom decided to send all the supplies out west to my sister's family in Utah. 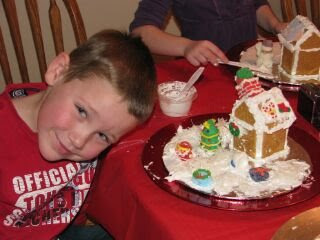 So here is a slide show of all 13 of the "Mapley grandkids" and their awesome houses! 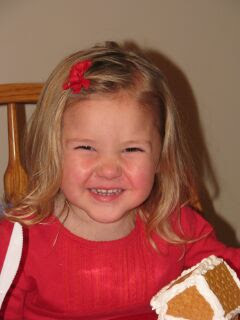 Last year a fun tradition was started of the grandkids heading to grandma and grandpa's to bake cookies. 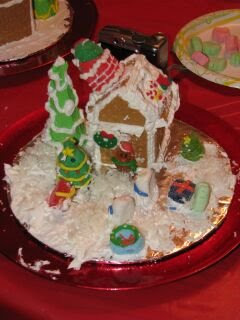 This year "Grandma" decided to do gingerbread houses too. 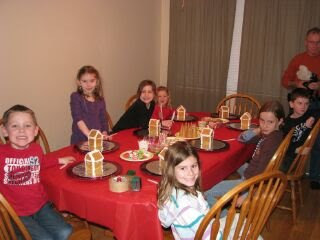 The kids had so much fun making them. Every gingerbread house was uniquely different. Grandma supplied plenty of decorations (which of course many also got eaten). After decorating their gingerbread houses the kids also put together several different cookies, baked them, and decorated them as well. 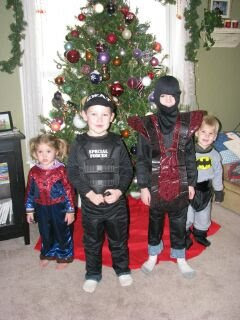 It was a busy yet fun filled day at Grandma and Grandpa's house! It's so fun to watch Bella this year in all the traditions. She's older now and much more involved in everything. She also pretty dang independent; wanting to do it all on her own and in her own little way. 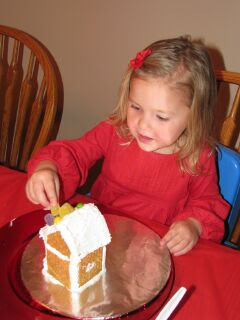 She had lots of fun putting candy all over her house. Isaac loaded his house up with lots of decorations. His very first choice (before anyone was even allowed to pick up anything) was the santa coming out of the red chimney. Here is Isaac's finished product. I forgot to get one of Bella's. Whoops! 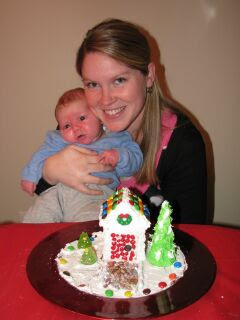 And now aren't you all so very amazed at the beautiful gingerbread house that Carter put together!?! He's my little prodigy... so proud. Of course I couldn't leave him out of the fun, so I put this one together for him. 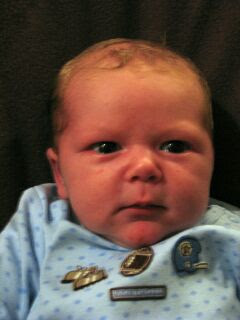 This is our little man Carter at 3 weeks. 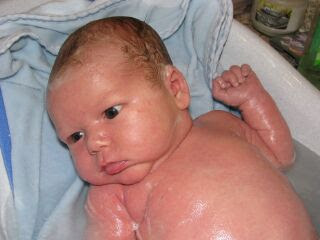 He has really sensitive skin, so he is usually pretty red and sometimes has raised rash on his skin. Poor little guy, but he's still absolutley adorable!!! 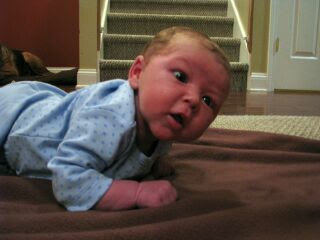 Check out how good he can hold his head up. He has been holding his head up since birth. His favorite way to be held is on our chest facing us, so he can hold his head up by himself and look around. It's so cute!